Commentary on the Card: The Queen of Fire is so rich, so much a queen, that she can afford to give. It doesn’t even occur to her to take inventories or to put something aside for later. She dispenses her treasures without limits, welcoming all and sundry to partake of the abundance, fertility and light that surrounds her. When you draw this card, it suggests that you too are in a situation where you have an opportunity to share your love, your joy and your laughter. And in sharing, you find that you feel even more full. There is no need to go anywhere or to make any special effort. You find that you can enjoy sensuality without possessiveness or attachment, can give birth to a child or to a new project with an equal sense of creativity fulfilled. Everything around you seems to be “coming together” now. Enjoy it, ground yourself in it, and let the abundance in you and around you overflow. 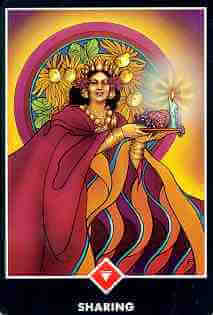 Meaning of the Card: As you move above to the fourth center–that is the heart–your whole life becomes a sharing of love. The third center has created the abundance of love. By reaching to the third center in meditation, you have become so overflowing with love, with compassion, and you want to share. It happens at the fourth center–the heart. That’s why even in the ordinary world people think love comes out of the heart. For them it is just hearsay, they have heard it; they don’t know it because they have never reached to their heart. But the meditator finally reaches to the heart. As he has reached to the center of his being–the third center–suddenly an explosion of love and compassion and joy and blissfulness and benediction has arisen in him with such a force that it hits his heart and opens the heart. 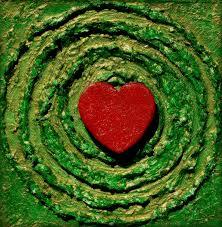 The heart is just in the middle of all your seven centers–three centers below, three centers above. You have come exactly to the middle.